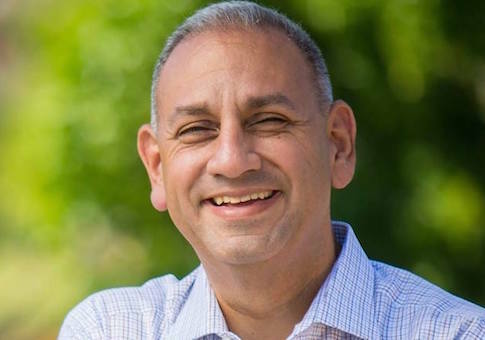 Gil Cisneros, the Democratic candidate for Congress running to replace retiring Rep. Ed Royce (R., Calif.), has campaigned as a champion for the environment, but his foundation invested in a gold-mining company that was fined $9 million for dumping more than 1 million liters of cyanide in five Argentinian rivers in 2015. Cisneros's campaign website highlights his plan to defend the environment from what he calls the Trump administration's "continuous" attempts to undermine federal clean air and clean water laws. "In Congress, Gil will stand up to the Trump administration and fight to ensure the Environmental Protection Agency stands by their directive to ensure all Americans have access to clean [sic] and clean water," the plan states. The plan promises that Cisneros will fight for the rights of people "whose water is undrinkable and whose representatives remain apathetic to their plight." "It's not politics, it's science: Climate change is real," the candidate tweeted in late June, including a link to his environmental plan. "We need to tackle this issue now, before it's too late. Here's how I'll get it done." The public pledges to protect the environment did not prevent Cisneros, a Navy veteran and former Frito-Lay manager who won $266 million from the lottery, from investing roughly $3,000 of his foundation's funds in Barrick Gold Corporation. The Toronto-based mining company has a history of multi-million-dollar fines for violating environmental regulations and dumping toxic chemicals into rivers and headwaters. The $3,000 investment in Barrick Gold was a fraction of the $13.5 million the Cisneros' foundation had invested in corporate stocks and corporate bonds that year, according to the 2016 990 form the foundation filed with the IRS. However, the investment still stands out as out of sync with the Democratic candidate's promises to protect the environment because gold mining is well-known for its adverse impact on the environment, and environmentalists have long criticized Barrick Gold, one of the largest gold-mining companies in the world. The Cisneros campaign did not return a Washington Free Beacon request for comment on the Barrick Gold investment. The gold-mining process often levels landscapes and the use of open pit mining and cyanide heap leaching produces toxic waste that is often dumped into nearby natural water bodies. Additionally, Amnesty International and Human Rights Watch have criticized the company over serious abuses of indigenous populations and communities in Papua New Guinea, including alleged home burnings, as well as gang rapes by security guards at Barrick Gold's mine there. Early in 2016, the year the foundation invested in Barrick Gold, an Argentinian court hit Barrick Gold with a $9.3 million fine for a cyanide solution spill that dumped more than one million liters of cyanide-sludge into five rivers in Argentina's San Juan province. Two years before the Argentina spill, a Chilean court fined Barrick Gold a record $16.4 million for 23 violations of its environmental impact agreement at the Pascua Lama gold project on the Chile-Argentinian border. After winning the Mega Millions lottery, Cisneros and his wife Jackie set up the philanthropic foundation, which has doled out millions of dollars in donations to charities across the United States. In 2016 alone, the foundation wrote large checks to local California schools and universities, as well as various charities, across the country, according to the 990 form. The donations included $100,000 to the University of Southern California Annenberg School for Communication; $50,000 to the George Washington University to pay for a "Cisneros Institute Senior Fellow Fund;" $50,000 to the Hispanic Scholarship Fund; $100,000 to the Congressional Hispanic Caucus; and $10,000 to the John F. Kennedy Center for the Performing Arts.